On Saturday PM, there was concern that it might rain and it might be windy as the theme had been throughout the weekend. Instead, the weather held off and a two part task was called. Due to the fickle winds heading lightly to the NE, a JDG and HNH seemed to make sense: pilots would try to fly to the Ag Grounds led by the Hare (Dale Ritchie) who would then land and set out a target which could feasibly be reached. The winds went to the NE on the surface and headed E further up. At about 2000 feet, a thick layer of cloud covered the sky which only one pilot ventured into. It turned out that the Ag Grounds were indeed difficult to reach with only one marker thrown by local resident and event organizer Jamie Kinghorn. Others got close but didn’t make it into the 75 m MMA. The Hare landed not much more than a kilometer further away because the winds were so light. Once more, competitors were hot on the tail and quickly started dropping markers. Jason Adams cruised in with a 1,11 m drop. Dr. Sandra Rolfe dropped too early and could have won. Good tosses were made by Del Michaud, Marvin Schultz and Bill Whelan. Unfortunately, Jamie Kinghorn was unable to drop on this occasion which had profound consequences for the standings. In the morning, it was windy and the ceiling was 600 feet so there was no flight. That meant that the awards would be announced at the High River Show and Shine, an annual event that brings a lot of people to town. It should be noted that this town of 9 000 is still in heavy rebuilding mode after last year’s flood and any reason to bring people to town is appreciated. 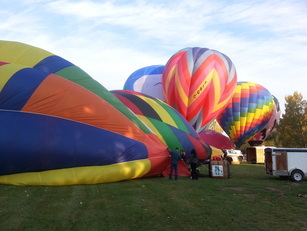 The Heritage Inn International Balloon Festival is becoming one of the new cornerstone events in town. 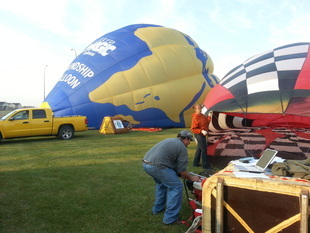 The event was in fact divided in two: residents of Western Canada were eligible for the Western Canadian Championship and all pilots could win the Heritage Inn International Balloon Championship. In this event’s two years of existence it has had a tough time getting consistent winds and weather linked to its proximity to the Rocky Mountains. However, it is run by a first rate team who are able to adjust to the circumstances and who have substantial support from the community. It was announced that next year’s Canadian championship will take place at the event and will send a Canadian to Saga for the 2016 Worlds. From 15 balloons to 22, the growth potential is excellent. To keep growing, pilots will need to start coming from further away and the town and organizers are ready to greet them. After Friday morning’s surprise rain, there was plenty of uncertainty on Friday night. Pibals revealed wind from the NE on the surface (from 030) and then turning left and coming almost all the way back towards the SW (from 230). Twice in the hour proceeding the briefing, a cloud passed by with just enough rain to bring all the computerized equipment back inside. Still, a HWZ was called with two targets with the expectation that pilots could stay below 1500 feet and make it to one of the two targets before quickly landing and heading back to the glow. The sky cleared beautifully but with it brought a change of winds once again. The task was changed to a HNH with Dale Ritchie playing the role of hare (his score would be the median of all pilots). So my measuring team was called upon to chase him and get a target out before the others dropped their markers. Ritchie dropped down for a little while, looking like he might land. Then, he went back up to keep catching the wind bringing everyone to the NE. As he came down for his landing, he moved to the NW right on the surface. Not everyone noticed this. Within a minute of landing, the ‘X’ was put into position. His earlier dip meant the pilots had caught up to him and were now in position to strike. First was Jamie Kinghorn, the local pilot and event organizer, who swept in and came down just a bit too early sending his marker just outside of the 50 m scoring area. Next was Del Michaud, the two time defending champion of the Western Canadian Championship (he needed to be reminded of this as it had slipped his mind). He decided to throw from over 1000 feet and ended up just outside the X.
Jason Adams, who is now leading the event after this task, hadn’t made it far enough to the east and when he came down the swing to the west brought him further away but his throw was also slightly outside the scoring area. Finally, the fourth pilot to come in who had seen all of the action was a former champion of the event Marvin Schultz. In his Firefly 65, he climbed to 2000 feet before screaming down at 1000 ft./min towards the target burning heavily before dropping his marker just as the turn kicked in. His marker landed inside the legs to win the task at 4.21 meters. A video will be made available shortly. No other competitors dropped a baggie so they needed to rely on their logger scores. Cliff Skocdopole, who had been leading to that point after the first task, was a significant distance away and fell out of the top 4. On Saturday morning, there was rain in the forecast so it was assumed that by tradition, the opposite would be true. At 5:30, the wind was headed to the SW and the cloud was just over 2000 feet leading Garry Lockyer to call a PDG, PDG and FON. The wind picked up as time went on, but there was still no rain. As the target teams headed to their cut farmers’ fields, the balloons headed to CLA 1 once more. From there, a light rain started and the flight was cancelled. For the event to be considered a championship, three tasks over two flights must be called. There are still two flight windows to get the third task in to get a real winner this year. Wednesday’s PM Media flight was cancelled because of wind. A ‘Chinook’ – an arch strong, warm wind that comes over the Rocky Mountains – blew pibals around the parking lot before they even had helium in them. Thursday morning signalled a change as conditions were calmer. The first pibals sent up in the dark of night showed winds on the surface heading east before turning towards the northeast as they climbed. Garry Lockyer called a HWZ followed by a PDG about 10 km north of the town. Launch was to be from CLA1 which is a set of baseball diamonds on the south end of town - part of the goal is to have the pilots fly over town. The first flight was meant to ease pilots into the use of loggers. As the only competitive event in Canada this year, it is the only opportunity to practice using them ahead of international competitions. Once the pilots made it to the launch field and the target teams to theirs, the winds had shifted – a situation which happened a few times last year as well. The HWZ was cancelled and pilots were left to pick their PDGs. As pilots got up, the winds brought them anywhere from towards anywhere from 30 degrees to 170 degrees depending on their height. The only problem was the lack of wind making it difficult to go too far. The initial tasks called for a marker drop before 9:30 but with the changes, pilots didn’t take off until after 8:30 getting the level of urgency to move towards their targets a little higher. Only Cliff Skocdopole, who had qualified for the Worlds in Brazil but couldn’t attend due to last minute changes, was able to both get quite close to his target and drop the marker ahead of the 9:30 deadline. Three other pilots also scored while a few others pushed their drop-buttons on the logger a few seconds too late, though they would have had the best scores if they did. The warm fall sun brought the winds up again on Thursday afternoon cancelling the PM Flight. On Friday morning, the weather and director’s team were surprised to find that it was raining and the SMS system was used to cancel the briefing and flight. Friday’s PM flight has potential should the winds stay calm enough and the organizers and community are hoping for a repeat of last year’s successful glow which brought 5 000 people out in a town with a population of 10-15000. The rest of the weekend looks promising and pilots are hoping to have multiple opportunities to get points. Thanks to the fact that there has only been one task, everyone is still very much within striking range. After last year’s successful first event in a long time in High River, Alberta, a number of balloonists will once again descend on the Southern Alberta town for a fun and competitive event in late September. This time, there are 22 balloons registered (with the possibility of a 23rd) for the Heritage Inn International Balloon Festival - a huge increase over last year. With balloonists coming from Belgium, Alaska, Colorado, Ontario and across the West, this event is gathering momentum and this year is hosting the Western Canadian Championships (to compete, pilots must be members of the Alberta Free Balloon Society). It is growing on the strength of a few good reasons: the town welcomed balloonists with opened arms last year even though it was in the early stages of recovering from a devastating flood, the event was well organized and timely (pilots can head to Albuquerque right afterwards – even though it’s 26 hours away, most crops have been cut and the potential for wild thunderstorms and hail in the evening is diminished permitting evening flights), and it is put on by a sharp and experienced team who are dedicated to building an excellent event…hopefully for the long term. It is so exciting that Jason Adams and three other Ontarians are bringing their equipment across the country to be involved in addition to a few international pilots. Adams will want retribution after not being able to get off the ground in last year’s last flight. Still, he had qualified for the World Championships and in Brazil improved greatly over the 2012 result in Battle Creek. Last year’s winner and Canadian champion, David Gleed, won’t be participating in High River this year meaning that whoever wins will be a new winner at this event. There are a number of good candidates for that crown, including Adams, but also including pilots from across the West. Young stars Cliff Skocdopole and Brant Leatherdale proved they were in it to win it last year while the familiar cast of previous Canadian champions including Dale Ritchie, Del Michaud, Dale Lang, Marvin Schultz, Glenn Penner and Bill Whelan can all find glory on September 28 if things go their way. In fact, with local conditions playing such a huge factor, everyone has a shot at winning it all if they can figure out the mystery weather and understand the loggers. Last year, one flight had winds heading from the Northeast to the Southwest, directly towards the High River Airport. At flight time, winds could be found to go in any direction, except the Southwest, with Marvin Schultz winning one of the tasks simply by landing back where he took off. Another flight saw winds increase from almost nil to over 30 kts meaning that only three balloons flew in the competition, yet the fiesta pilots enjoyed a safe, normal flight. 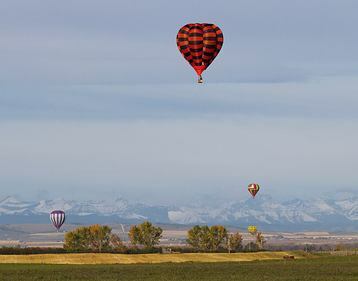 With the Rocky Mountains in the background, this year’s Western Canadians at the Heritage Inn International Balloon Festival should be another great showcase for ballooning for fans of intense competition and pretty shapes and colours* in the sky. *Note – colours takes a “u”, I swear!